SAMPLE! My own words are ringing in my ears….if you are using a new yarn or a new technique on your backstrap loom….sample, sample, sample. And don’t trust your first samples for making width measurements for future projects. You have yet to settle into the new technique and things are still bound to change. Keep practicing while you slowly smooth out the rough bits. Sample away happily knowing you can probably make something from the samples, no matter how small or silly! If not, put it in your notebook with lots of notes beside it…believe me, you will forget if you don’t write it all down. Here are a couple of small samples that I managed to make into decorative and useful things. My log cabin sampler got used as the cover of a flip notepad that always goes with me on my travels. This notebook is now full and I need to get the cover off so I can somehow fix it to another notepad. My first ever shadow weave sample got pulled off the loom as I was satisfied once I saw that it was working and I didn’t really care for the color combination. It got made into a small sewing kit purse which also goes traveling with me. And never mind if your sample ends up with wonky selvedges and you don’t know what to do with those pesky raw edges. There is usually a way around all that. The edges of my log cabin piece were turned around the ends of the notebook cover and glued down. Another piece of fine cardboard glued to the inside covered those edges for a neat finish. The zip took care of hiding and protecting the raw edges of the shadow weave piece. I thought I would show in this blog post some of the finishes that I have used for my pieces, uses I have found for samples and different ways that I have dealt with raw edges. Width needed some adjustments and I learned to beat a bit harder as I progressed. 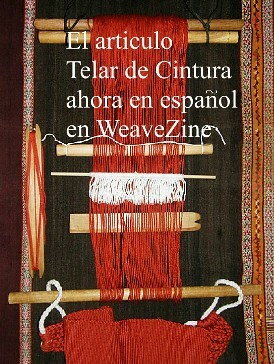 I learned a lot about how to read from the weaving rather than from the chart with the design on the left. This is from one of the Prairie Wool Companion 1982 issues. There is a Chinese lattice work design charted and then three variations provided so that one can weave a set of four placemats. The version I chose is the one furthest removed from the original Chinese design. The design on the right is one I invented using the little pre columbian birds that I wove before and gave me more practice with filled-in shapes. 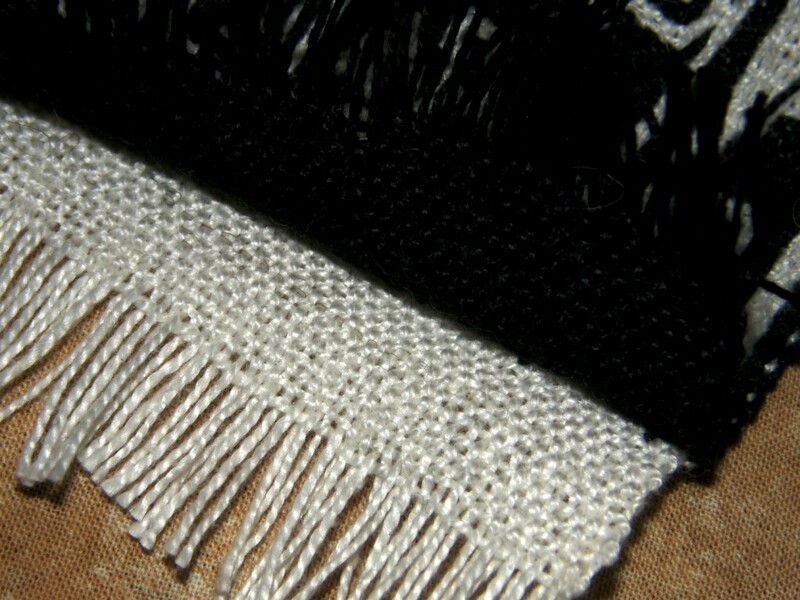 This is a double weave and it is particularly tricky dealing with its raw edges. Folding over two layers to hem is bulky and unsightly and so I followed the advice that I read in an article and wove the start and finish of each piece as two separate layers with open edges. The idea is to turn both edges inward and sew them together like that. However, I didn’t do that. As I was going to sew in a zip, I cut the white layer back as far as I could and then simply turned the black layer over it. The black turned edge got sewn down and hidden under the zip so all is well and protected and nice and neat to boot. This may just be something that I am goofing up, but to my eye, the edge is ugly as you can clearly see how both layers of contrasting colors come together. A row of single cross knit looping covered that up nicely as you can see on the right. However, my eyes just about fell out…black on black. I had to stand right by the window in good light to do this. So that was one solution to the ugly edges. 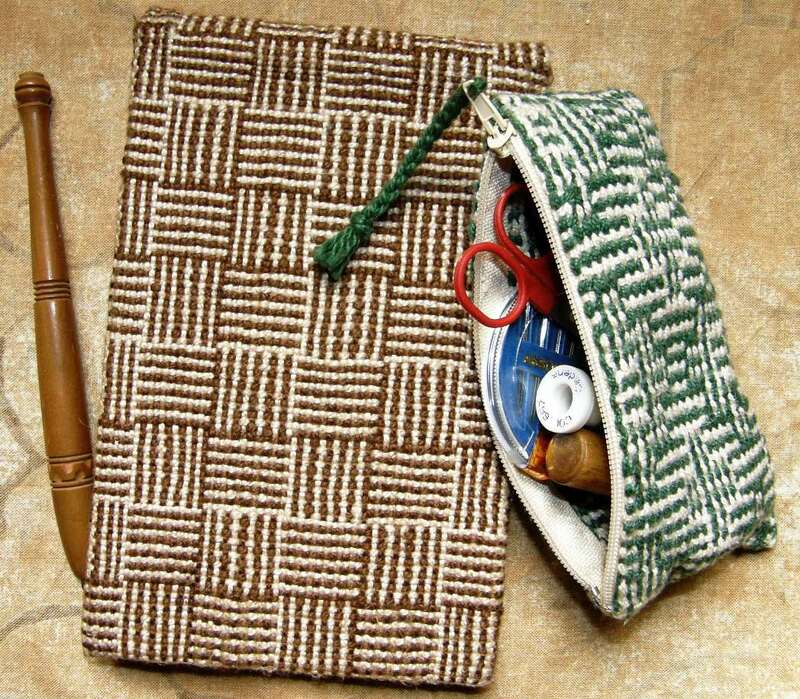 On the other little bag, I added one of those woven bands that are woven and sewn simultaneously using the weft as the sewing thread. I used it down the side and along the bottom and it broke the design up nicely between the two faces. 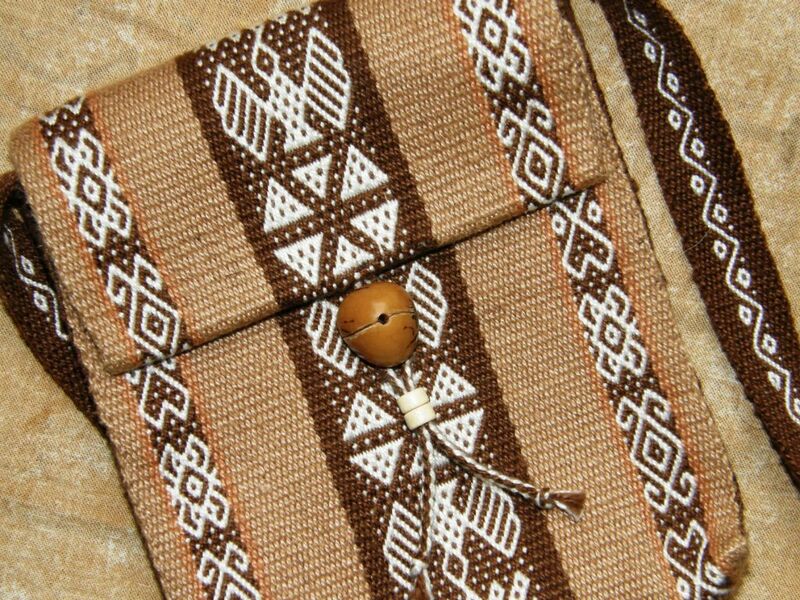 A four-strand braid for the zipper-pull was the finishing touch. Speaking of braids I made the zipper-pull for my loom bag project…remember? – woven bag, braided zip-pull and twined strap. It’s a 24-strand braid worked in the hand as my Peruvian sling braiding teacher had shown me. I had not done this kind of braid in this size yarn before and so it was a bit of a challenge. This is the base of the Margarita braid but as, I was so focused on just keeping everything in order while muttering the moves to myself, I did not venture into doing the changes in sequence that produce the diamond designs on the Margarita-style braid. The cross knit looping that I used to hide the ugliness on my finnweave piece can sometimes be added to perfectly good looking selvedges as an extra decorative feature or it can be used to draw attention to or hide the place where two pieces of fabric are joined. 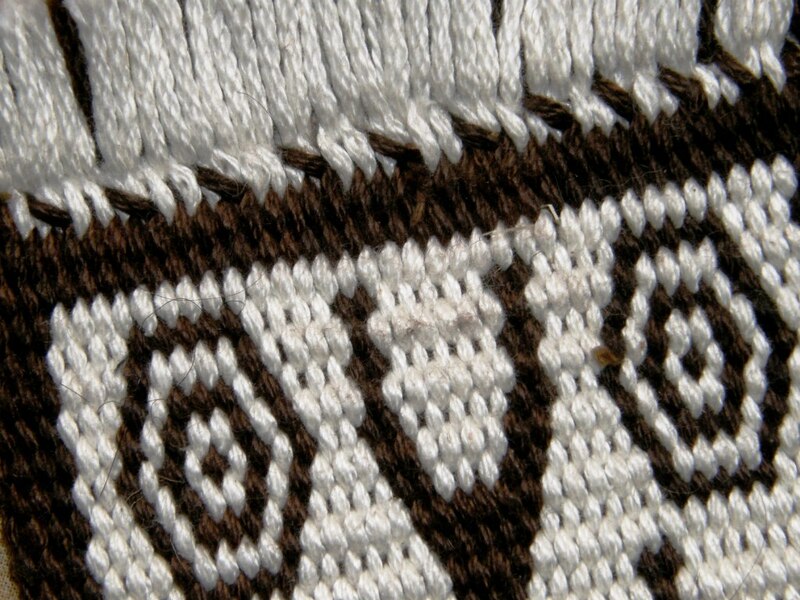 This is also known as Van Dyke stitch in embroidery (see the video embedded in this blog post). Other things that can be used to disguise a less-than-perfect edge or brighten something that is a little too plain are braids. A two-color stitch can look good on the edge of a very plain one-color piece or hide its wonkiness if necessary! This was a sample I made for a plain warp-faced weave weave-along. I sewed a four-strand braid around the edges which also served as a strap. Again, the zip handily hides and protects the raw edges. 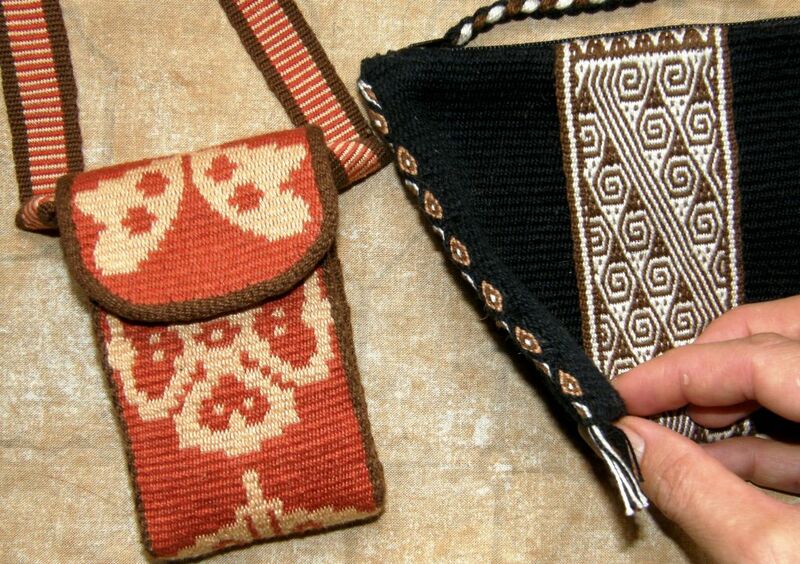 This little pouch was started with a third selvedge which you can see on the right. I sewed across the raw edge with very visible stitches as neatly as I could by hand and then sewed that edge down. Then there’s good old hem stitching which I only learned fairly recently from this video. I got such a kick out of learning and doing this the first time, I wanted to go around and hem stitch everything! Teeny tiny “invisible” hand stitches seem to work well at the bottom of book marks and keyfobs. 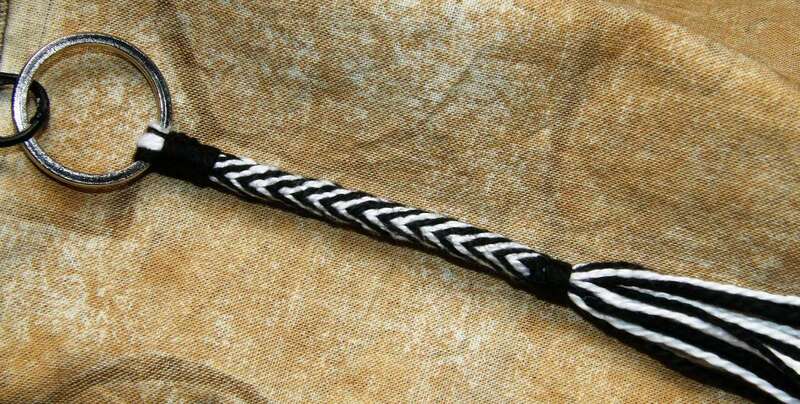 Warp ends can also be braided. I like to dab the ends of the braids with diluted white glue and squeeze them into a tapered shape as they dry. I think it looks better than having knots in the ends. 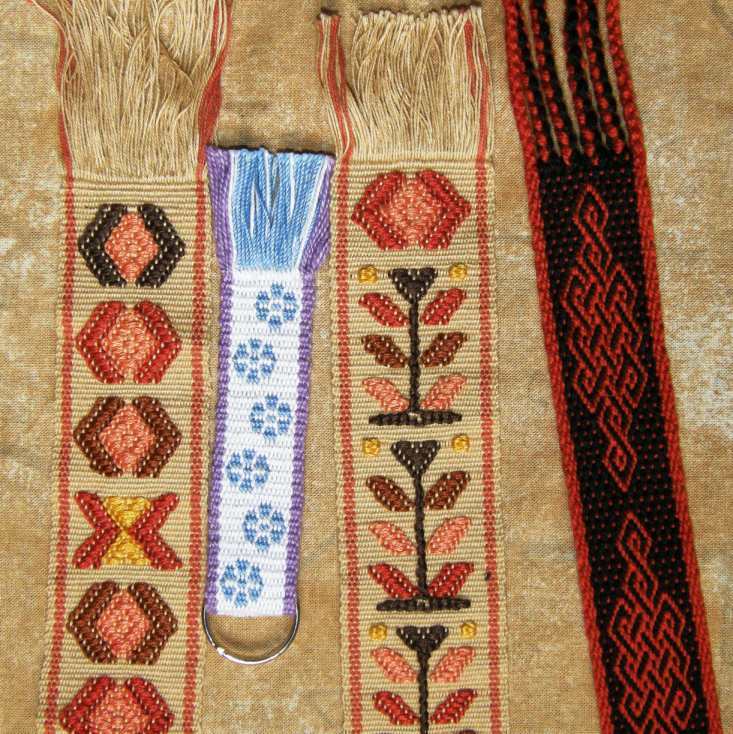 Above are some bookmarks decorated with Guatemalan supplementary weft designs, a double weave key fob and a pebble weave Celtic knot pattern. I am not so convinced about the way that I chose to deal with the raw edges on these very thick double weave mug rugs. This came after many attempts to sew them neatly and invisibly. They are too thick for the method I suggested earlier where you weave the two layers separately and turn them in on each other. I figured if I couldn’t make the stitches invisible I would go for very visible and decorative, and something in keeping with the ethnic nature of the design. This is the back side. 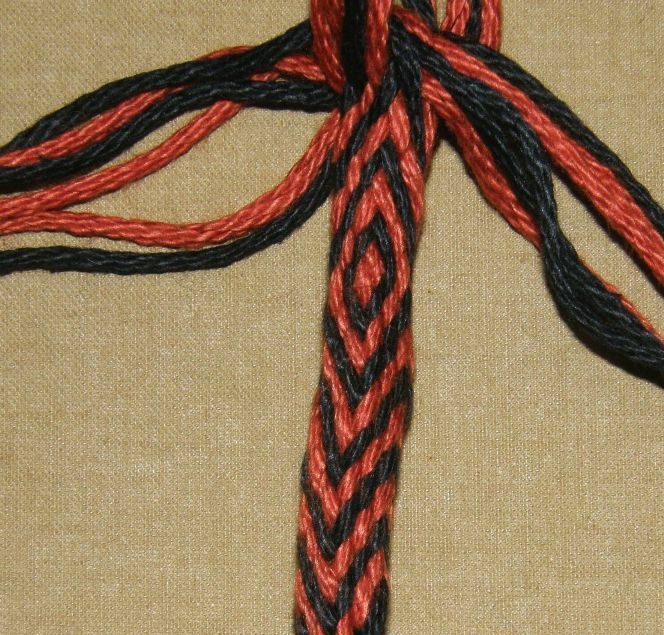 The brown thread cannot be seen on the front. I sewed these while they were still stretched out on the loom and had to put a mirror in my lap so I could see how the stitches were being placed on the back. I am open to suggestions for improving this! On the Bedouin design wall hanging that I did on the right I also twined the edge and finished it off with wrapped warps. 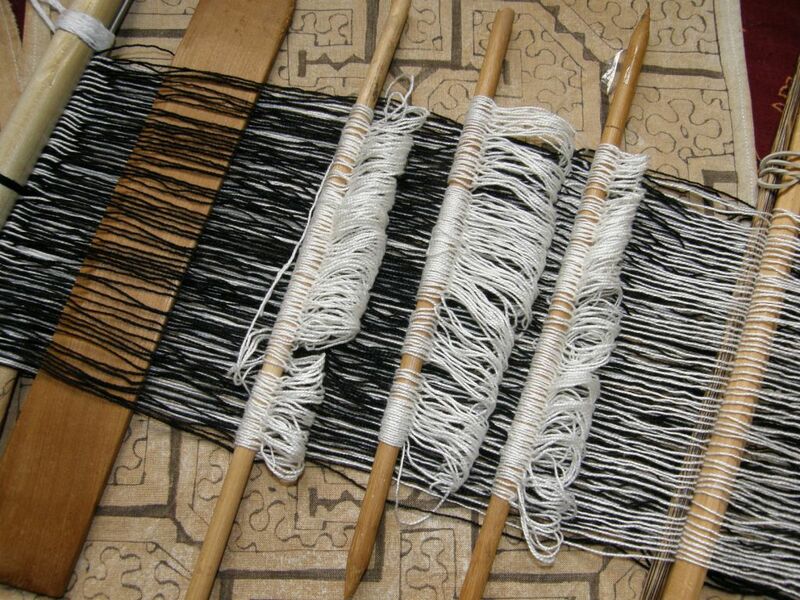 Warp wrapping, braiding and other finishing techniques are covered in Finishes in the Ethnic Tradition by Karen Searle and Suzanne Baizerman. 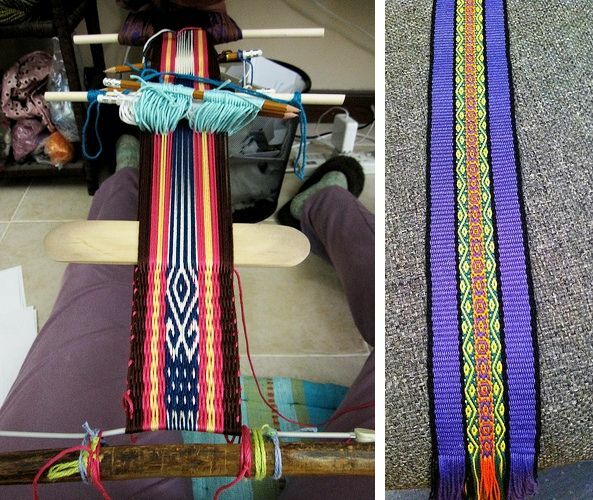 My latest favorite edging which I learned at the tinkuy de tejedores in Cusco last November is the tubular woven band which is woven and sewn simultaneously to edges shown below on the right. This is another one that totally grabbed me. I had to stop myself from tubular banding everything in sight! 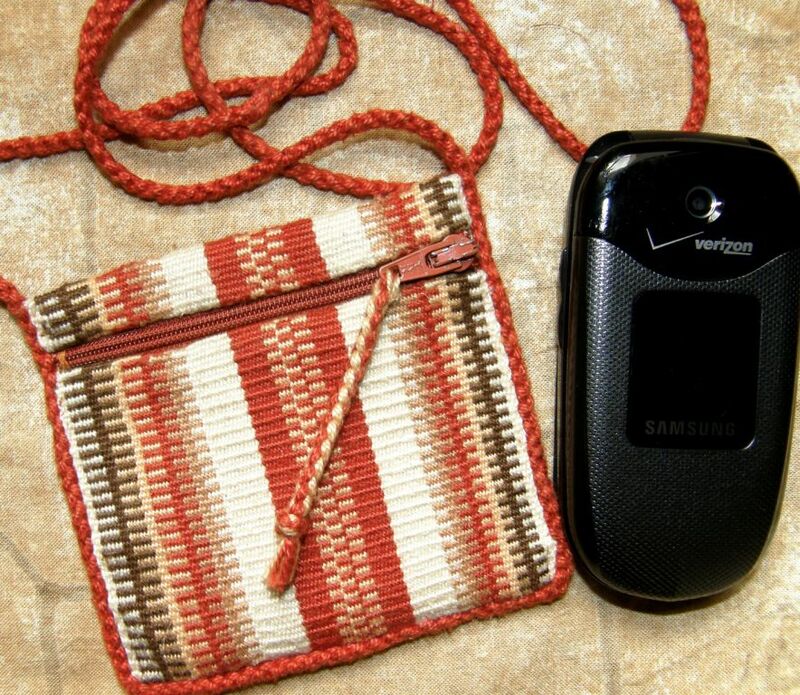 I decided to try a plain weave single-color band as an edging after seeing how Guarani weaver Angela edges her pieces and I used it on the cell phone pouch above. It very nicely covers and protects the raw edge where I cut and shaped the flap. Well, enough about smoothing out the rough, brightening the plain and taming those wild warp ends. Back to finnweave. 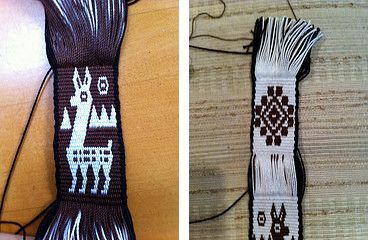 I am still enjoying the Cora and Huichol pieces and traditional Scandinavian patterns and have just learned that another Mexican group, the Otomí, also practice this technique. 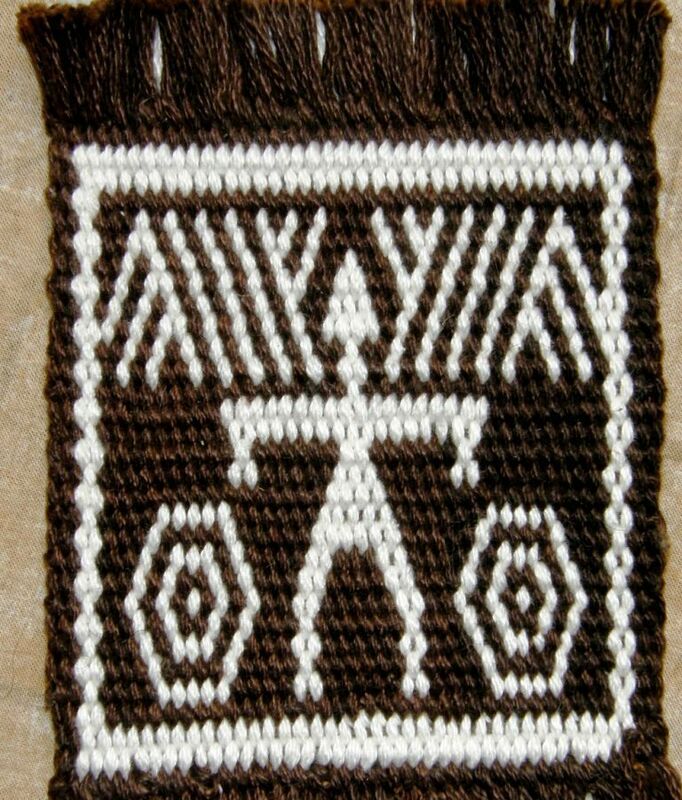 However, I am returning to my original goal now and am about to chart my first pre columbian design based on one of my textile fragments. This will be another sampler and I will wet finish this one. What have the weave-alongers been up to? Linda wove her first band with horizontal bars getting warmed up for simple warp floats. 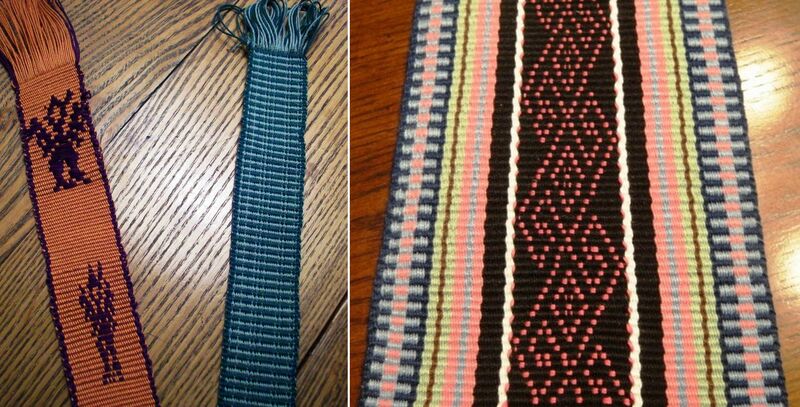 She also made supplementary weft samples so she could learn about the scale of her charted designs against the woven fabric before launching into a project. Bobbie finished her piece with the central supplementary weft pattern. The chart for this design is here. I really like the effect of the different colored horizontal bars design that she used on the edges. After finishing another pebble weave piece, Jennifer shifted to double weave and enjoyed sampling the technique in #3 crochet cotton. The llamas are charted here. Tracy is back from her trip and back at the loom doing pebble weave. 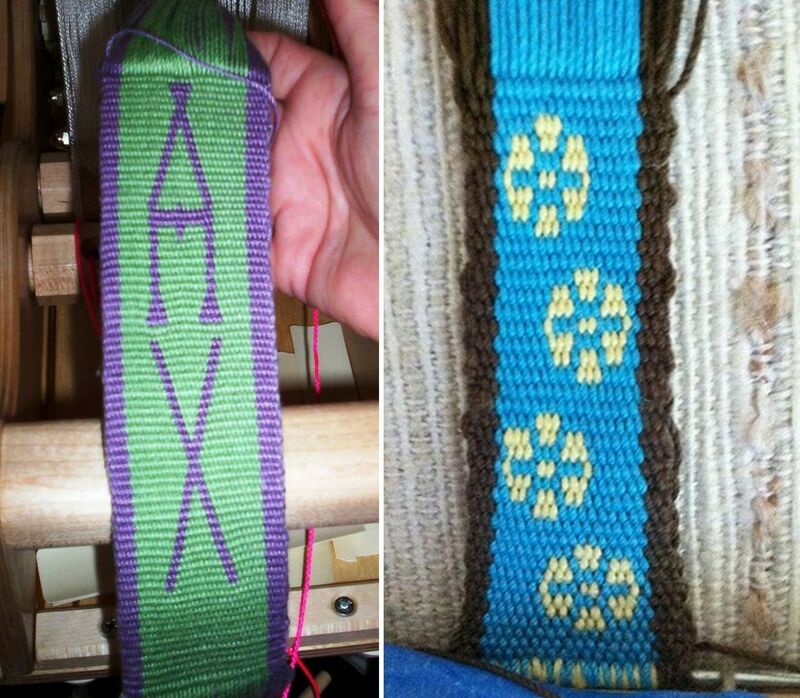 Tracy’s latest band is on the left and Jennifer’s finished piece is on the right. You can see that her knitting needle is not standing up to the task of creating her third selvedge. You can read some tips about starting with a third selvedge here. Both Marsha and Jennifer tried double weave in #10 thread but decided it was too fine to tackle yet. Marsha is doing a double weave band, her first with a pattern, in #3 thread. She is writing the name of her roommate on what will be the strap for a camera bag. Jennifer made a keyfob as her first attempt with #10 thread and is happy to continue sampling with #3. 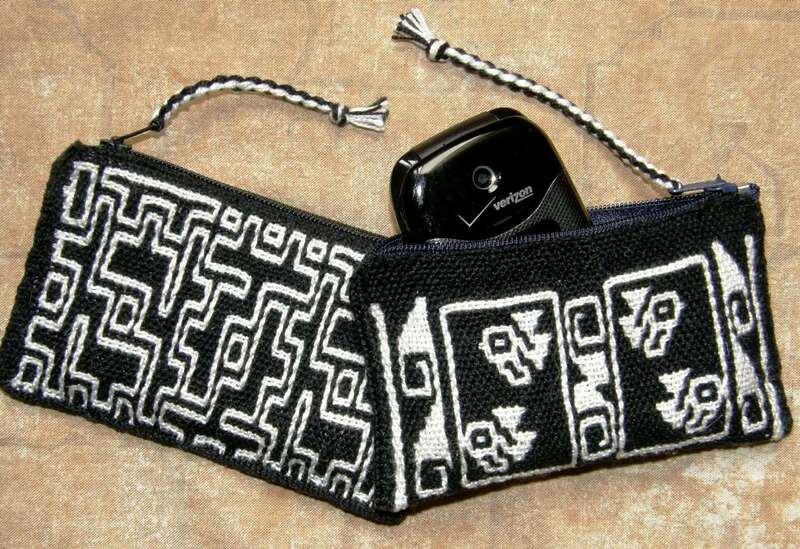 Helena in Brazil finished her pouch and has attached an adjustable band with buckle for her sister to use on her trip to Australia. I love that orange! There are ideas here for fun ways to combine colors, right? The central design is one I invented and include in my book. I made it to go in a wall hanging along with the adaptation I made of a Huichol motif. This design includes the diamonds, spokes and curls that were also elements in the Huichol pattern. Short, Narrow Warps and Sample, Sample, Sample! Good morning Laverne! As usual a wonderful post. Me, you, Wiggles, Lacy and a cup of good coffee. I had a thought…do you sell your little pouches? I would so love to have one, as I am sure others would! I simply love what you are doing with the balance double weave. Of course I still have to get up the nerve to do some pebble weave. I think though, that my next project will be double weft double weave. I am doing a donation piece to the ‘Relay for Life’ Cancer drive next. I did this last year also. They will auction the donation and contribute the monies to the cancer research. I want to do a wider piece with some design strips in it. Maybe some wording…I lost both parents to Cancer and this cause is dear to me. Great Blog Post, Much inspiration an dgreat ideas. I really liked the Chinese Lattice patern you used here in the Finweave sample, it is very similar to a patterned section I have just finished in my Ply-Split braided bag strap, I will have to get a picture up for you to see. Maybe the pattern I have used is in your Prarie Wool Companion too. You are truly amazing in what you do. Love it!! Wow, those wrapped warps are a beautiful finish to the Bedouin piece!